When I went down to visit Gizmo this morning, the cold rain had pretty much eliminated the ice, snow, and slush that helped make the Thanksgiving holiday such a joy. 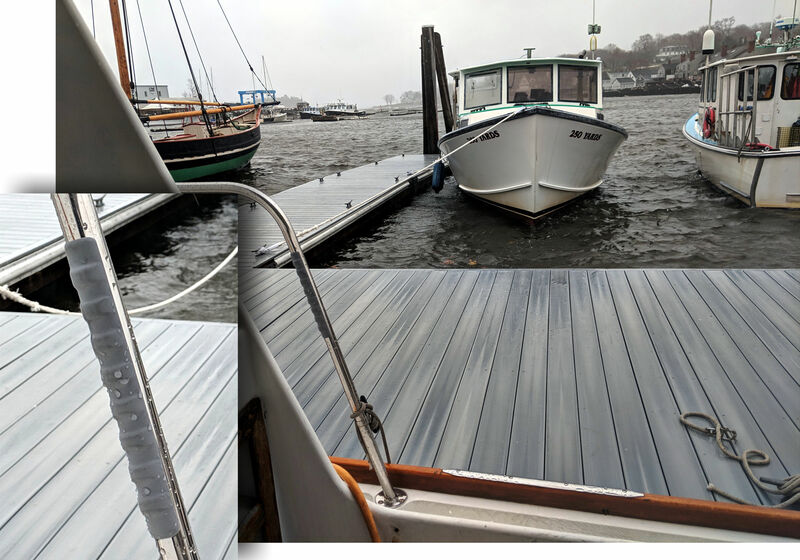 But that composite float decking still felt a little “greasy,” especially given the 30+ knot Nor’easter that was pushing enough of a swell into Camden’s innermost Inner Harbor to sometimes roll my poor boat about 20 degrees. But mission accomplished: My very first use of that 8-inch Edson ComfortGrip Strip just installed on the stanchion I grab to help me (or anyone) get aboard was much appreciated. Frankly I wasn’t confident that the ComfortGrip would even be there this morning, as I may well have installed it far outside the recommended air temperature. I trust that instructions are included with the normal packaging shown below, but above is all that’s left of the sample that Edson was handing out at METS. More evidence of my marginal install was how poorly the strip first adhered to the stainless stanchion in dank 37-degree air, and while that did make it easy to adjust the grip’s position, I had to wrap my bare hands around it for a while before the ends stayed in place, and even then it felt unwise to actually grip it. But the ComfortGrip seems quite solid today, 3M adhesives have surprised me in good way before, and I expect an install in more normal conditions will be easy and quickly solid, a supposition I’ll test with the 12-inch sample. 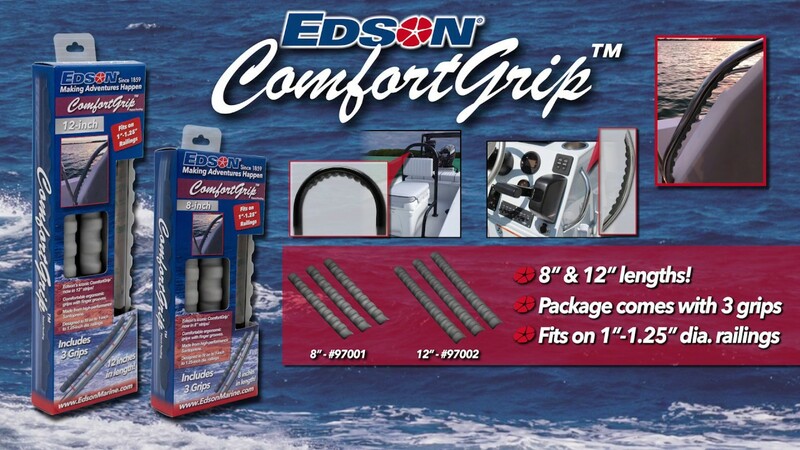 There’s also the flybridge destroyer wheel, and ComfortGrip first earned customer appreciation on certain Edson PowerWheel models. But then again, a sailor still lurks on Gizmo and I’ve long had a mental image of sitting by the winter fire taking a careful crack at crossing stitching a leather wheel rim cover kit, maybe even in the other ComfortGrip style, which adds cushioning and finger contours under the warm, soft, dove gray “orthopedic grade” cowhide. I digress. 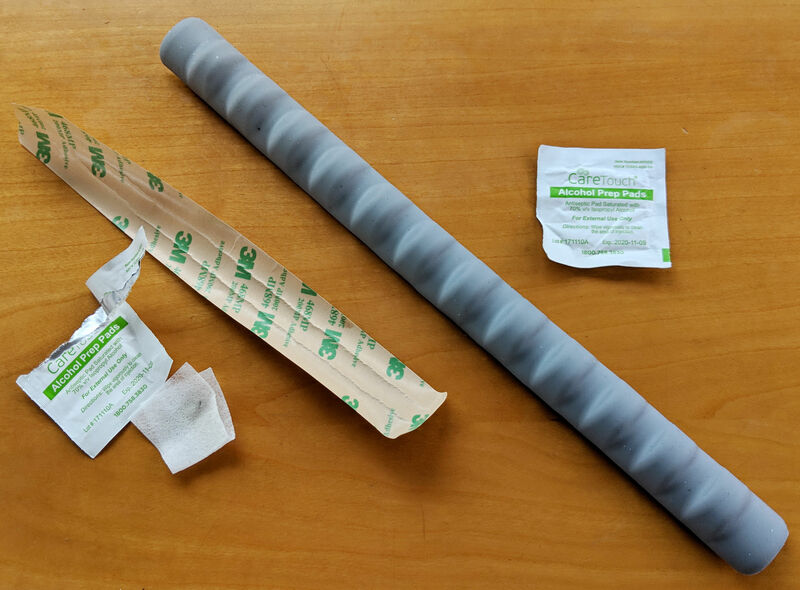 My bottom line on ComfortGrip is that here’s a small innovation that let’s a DIY boater make a small improvement in a few minutes. There’s little doubt that some will find $25 for three 8-inch strips ($29 for three 12-inch) pricey, but that’s how they may get placement near a boat shop cash register near you (and better deals may appear). And while I don’t think that fear should be a big factor in boating — statistically, it’s quite safe — what’s the value of preventing a fall that might already be in your future, especially if you’re nutty enough to keep a boat on a long float through a Maine winter.